Roshanfekr, H. (2014). Estimation of Genetic Parameters for Kleiber Ratio and Trends for Weight at Birth and Weaning in Arabi Sheep. International Journal of Advanced Biological and Biomedical Research, 2(11), 2830-2836. Hedayatollah Roshanfekr. "Estimation of Genetic Parameters for Kleiber Ratio and Trends for Weight at Birth and Weaning in Arabi Sheep". 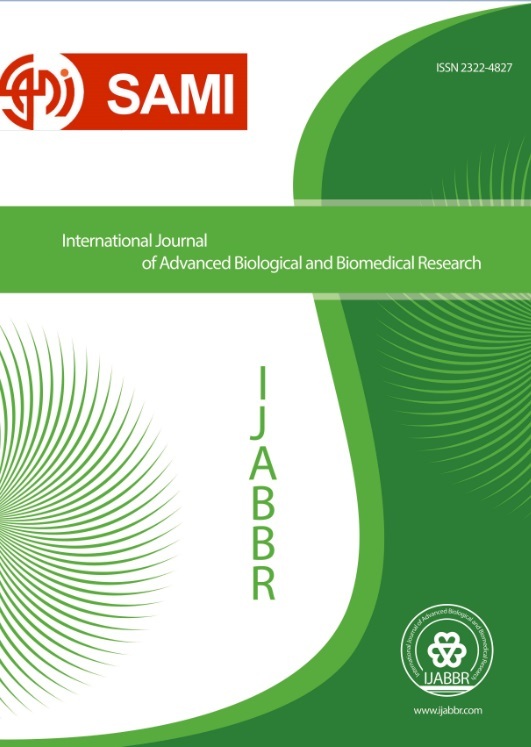 International Journal of Advanced Biological and Biomedical Research, 2, 11, 2014, 2830-2836. Roshanfekr, H. (2014). 'Estimation of Genetic Parameters for Kleiber Ratio and Trends for Weight at Birth and Weaning in Arabi Sheep', International Journal of Advanced Biological and Biomedical Research, 2(11), pp. 2830-2836. Roshanfekr, H. Estimation of Genetic Parameters for Kleiber Ratio and Trends for Weight at Birth and Weaning in Arabi Sheep. International Journal of Advanced Biological and Biomedical Research, 2014; 2(11): 2830-2836. Objective: Estimation of genetic parameters for Kleiber ratio (KR) and genetic trends for pre-weaning weights of Arabi sheep has not been previously conducted.Methods: Data and pedigree information were collected at the Khuzestan Ramin Agricultural and Natural Resources University, Animal Science Research Station, located in southwest Iran, from 2001 to 2008. (Co)variance components and corresponding genetic parameters were estimated using the restricted maximum likelihood procedure by excluding or including maternal genetic or maternal permanent environmental effects. Six animal models were fitted to optimise the model KR from birth to weaning, which is defined as the ratio of growth rate and metabolic rate and can be utilized as an indirect selection for feed conversion. Moreover, three-trait analyses were performed using the most appropriate models obtained in single-trait analyses on the basis of Akaike’s information criterion. Results: Direct heritability (h2d) estimate of 0.11 was obtained and maternal permanent environmental effects (pe2) contributed 10% of the total phenotypic variation for KR. Genetic trends for weight at birth and weaning were obtained by regression of average breeding values, on birth year. Direct genetic trends were positive and significant (p < 0.05) for weight at birth and weaning (6 and 24 g per year, respectively). Genetic correlations among traits ranged from -0.52 to 0.89 and phenotypic correlations from -0.21 to 0. 0.71. Results showed the importance of inclusion of maternal permanent environmental effects in designing appropriate breeding programs to obtain accurate estimates of genetic parameters, and it is sounded that KR is a recommended option in selection program.